Washington, D.C. - Friday morning, 8:15 AM - May 12, 2006. It was the first day in nearly a week that I had ventured to step outside of the apartment where I had taken leave for some much needed jet lag recuperation; having just returned from an 8 month stay in Egypt. Stepping off the train and onto Farragut North metro station's platform, the first thing I heard was the strum of a guitar accompanied by the voice of its owner - a surprisingly melodious tune triggering memories of so many other mornings when I had taken the same route to work in the not so distant past. Beautifully clear sunlight filled my eyes as the escalator carried me closer to street level. Ever so slightly, the crisp morning air flipped a corner of the scarf covering my hair and dashed a splash of color across my cheeks. I felt a rush of adrenelin surge through my veins. Everything was just as I had left it; from the musician at the top of the sidewalk, to the hustle of commuters heading toward offices where they would spend the day working. 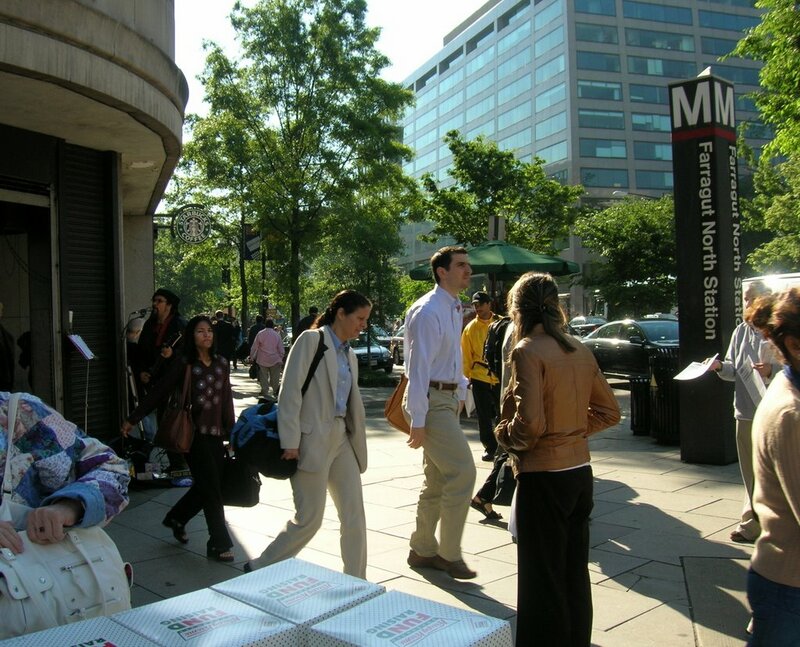 To my right was a woman selling boxes of Krispy Kreme donuts, $5.oo each, for some worthy charitable cause; a dedicated activist stood nearby handing out flyers imploring readers to support a pressing political issue on Capitol Hill. The familiar flower vendor was parked in the same place as always, offering an array of colorful blossoms sure to brighten the desk of many a commuterr, and for a surprisingly reasonable cost. Just above the musician's head, from where he had positioned himself at the top of the escalator, I spotted the familar green and white circular sign affixed to the wall of my favorite morning stop; pulling the door open, the aroma of freshly brewing coffee rushed to my brain...decisions, decisions...it's been sooooo long. Chai Tea Latte. I turn the corner, heading to the office - treasure in hand. Stepping through the gleaming, heavy glass doors and into the lobby, a familiar face greets me. Big smiles. Exchanged greetings. The elevator doors open. I step inside. Instant brain freeze. For a moment I forget which button to push on the elevator's control panel. Latte still in cup; not doing me any good there! Ahhh! Six...whew! Dual recognition as I step out of the elevator to meet the smiling face of a favorite receptionist. Subhan'Allah...she is still there. I approach the counter; she rises. We lean in for a quick hug. "Where's George?" "He's off today." "Awwwww..." "Anyone here yet?" "No." "Ut, oh!" *lol* And so the day began. Copyright © 2006 - Aishah Schwartz Permission is granted to circulate among private individuals and groups, to post on Internet sites and to publish in full text and subject title in not-for-profit publications. Contact author for all other rights, which are reserved. Wait are you back for good or just an extended visit??? ITs funny because I know SOOOO many ppl either going to egypt, just getting back from there and really really wanting to go there and study)im part of this last group)..